Our caravan altyarm is feature packed for you and your caravans safety and security. It boasts an ear piecing 120 Db alarm and is controlled from a key fob. The alarm runs off your 12v leisure battery but also comes equipped with an internal backup battery to keep it running in the event of a flat. The alarm features A new electronic tilt and motion sensor which has automatic calibration and easy sensitivity adjustment from the key fob. 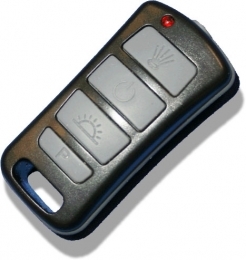 A Superb new splash proof key fob design using code hopping and anti grab electronics. Incorporating an LED torch for night time convenience along with buttons for arm/disarm, awning light and programme mode. The new high efficiency multi-angle PIR unit with a flat design gives a modern look and reduces the risk of damage. User programmable arm/disarm beep volume. Seven user selectable volume levels from loud for the hard of hearing to quiet for night time use.